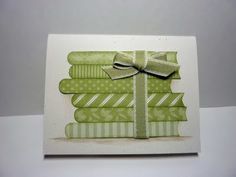 KAREN BURNISTON’S YOU TUBE VIDEO OF HOW TO MAKE THIS CARD. 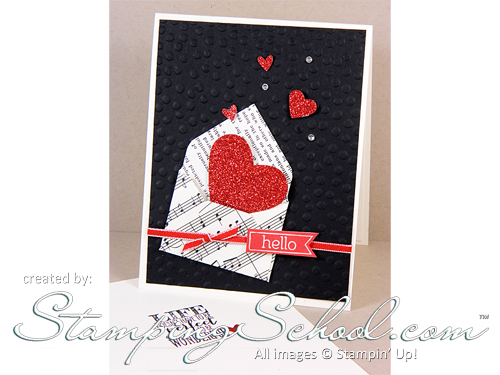 She is using a die from STAMPIN UP called Pop ‘n Cuts….however, it is not necessary to make this card but it won’t have the little insert tabs on the front but I have no problem without them…Watch the video ( click the blue link above) then you can look at Janis’s card with the butterfly and some of my valentine ones. Trust me it will be much EASIER if you watch the video and then keep it near by before you attempt this one on your own…at least that was my experience …though I have finally gotten it down…I did not see the video till after I had made as many screw ups as possible and remember you don’t have to do all the embellishment that Karen does in this video. 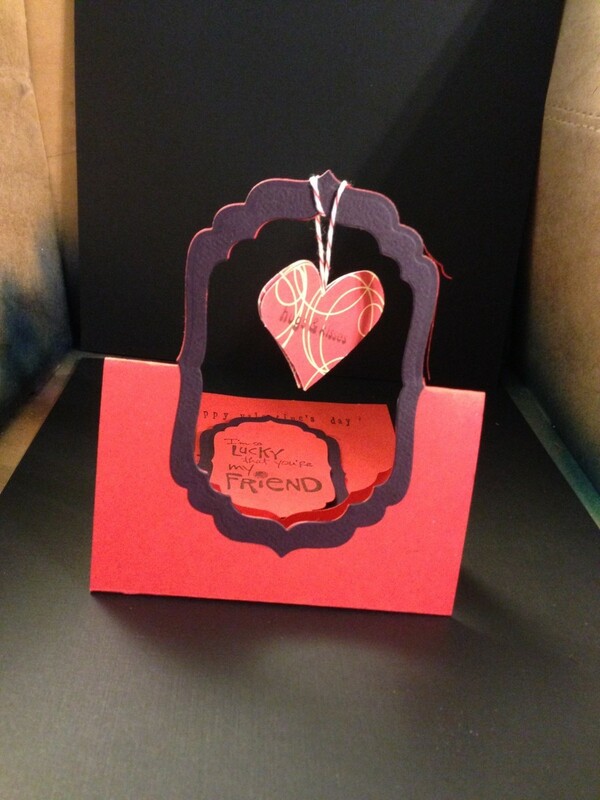 This one is JANIS BELVIN’S CARD THAT SHE SENT TO ME. This last one is the one I did COMPLETEL UPSIDE DOWN AND BACKWARDS…LOL..I have it upside down with the flying part…it should be up by the fold not at the open end but I am using it anyway…in any a case I think you’ll like it… its a fun card and with the video then it is easier… sometimes I just tend to complicate things …THANK YOU JANIS for sending me the card and sending me the video link. cut square 3 ½ ” then line up at 1 ½’ and PUNCH…. SCORE… and continue around all four sides…following the directions for making any of the envelopes. HINT if you are using light weight paper(designer style) DON’T PRESS HARD or you will score right thru the paper in effect cutting it. Now there is also a large punch by MARVEY that is an envelope punch and there is also a die by SAVVY I think that cuts an envy about this same size… The die is I am sure available from IMPRESS RUBBER STAMPS and maybe the punch too. 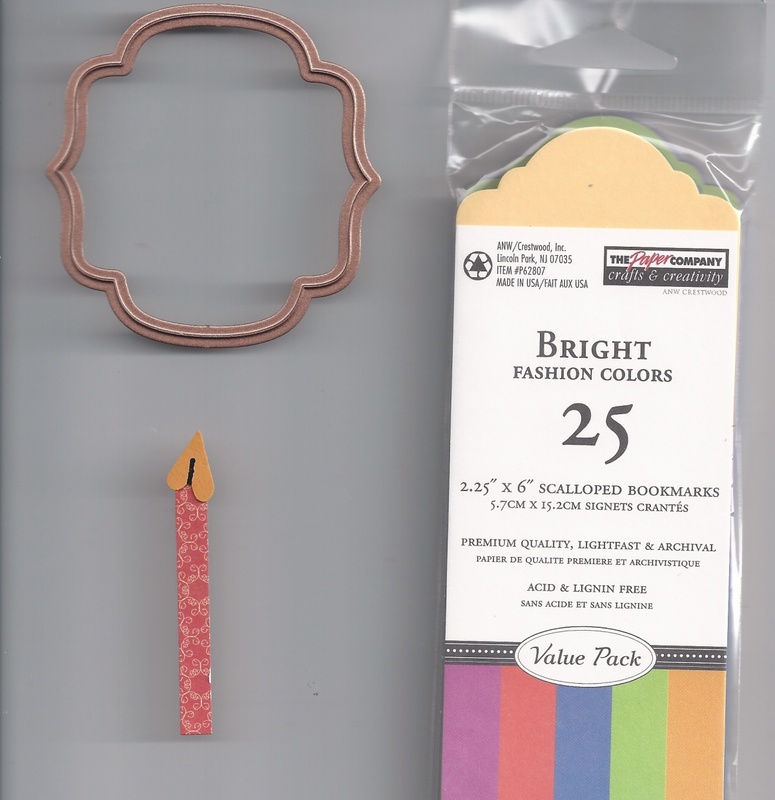 Sometime I see the punch at one of the craft stores but not often… also try Amazon… it does make a much smaller envy but it can work by using more then one on the front… or making the smaller 3 ½ x 5 size card ( cut card stock at 7 x 10 and score at 3 ½ for horizontal or at 5 for vertical. ) 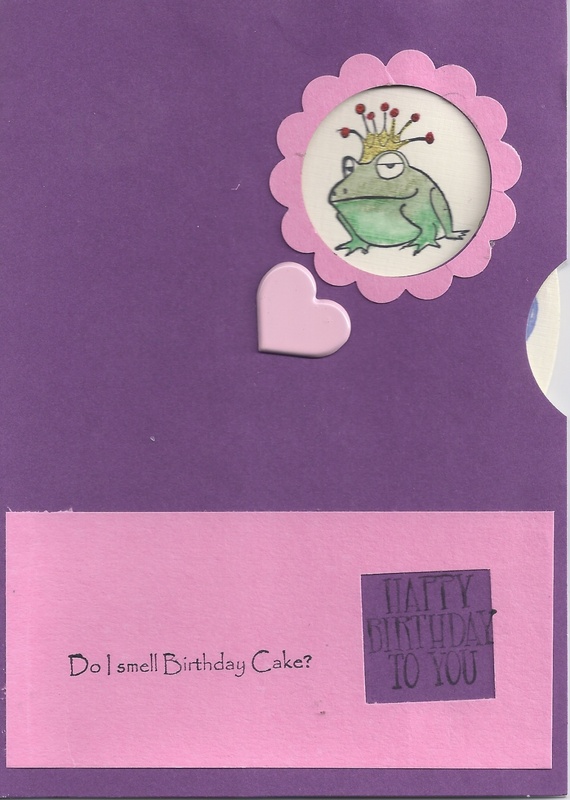 So here is one of my cards using the Marvey Punch …( its green and purple)…oops well sorry guys I just did some research on the Marvey Punch and its discontinued. 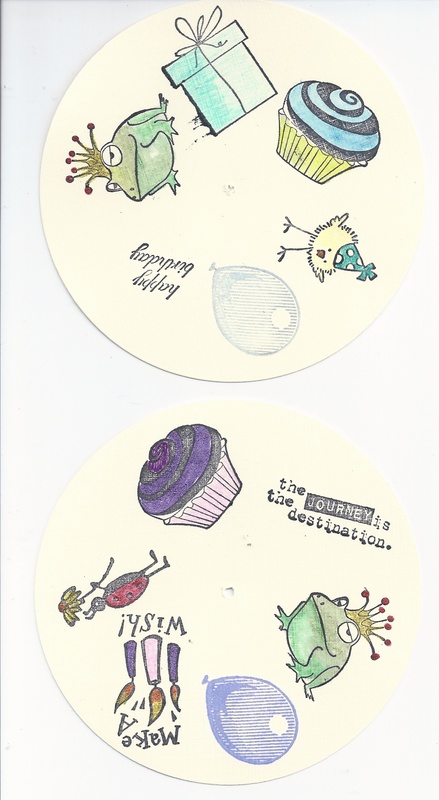 However the SAVVY die is available at IMPRESS RUBBER STAMPS. I can’t show you the SAVVY die because I loaned it to a friend but it is almost the same size as the one I made using the envelope punch board. PAPER EYE CANDY....you may have seen some of these from a previous posting but there are new ones in here and they are all so amazing… I am so humbled when I look at the paper cutting and think of my pitiful little cards… anyway enjoy. 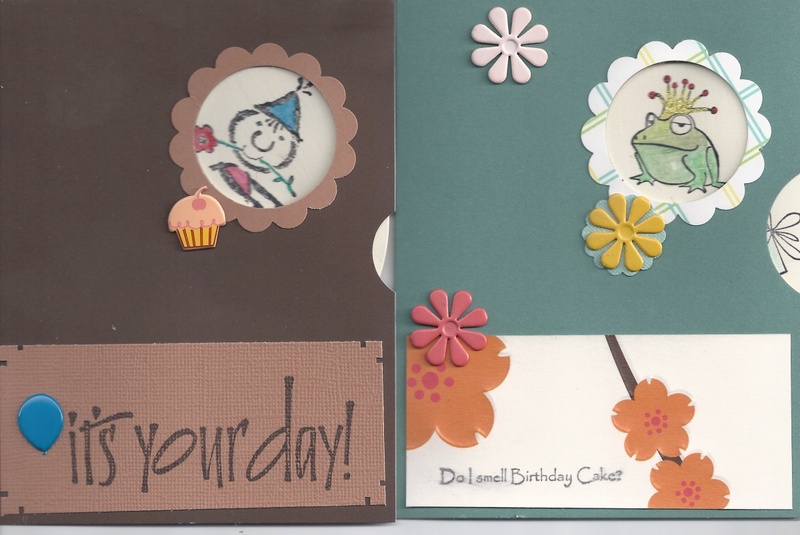 I am pretty sure I have told y’all before that SPLIT COAST STAMPERS, DAWN AND STAMPING SCHOOL are all at least partially attached to STAMPIN UP… so sometimes it comes a no surprise that each of them have the same or similar card videos. You may also remember that STAMPING SCHOOL requires a paid membership of approximately $37 dollars a year. Now Dawn and SCS are both free. I loved this card and STAMPIN UP HAS THIS NEW PUNCH THAT they are using to make this card…however, I don’t have it and while its cute…its pricey and I just didn’t think I needed it…..and I was pretty sure that I could use one of the nestibilities dies to cut the top of the card…LIke cutting the window on the gate fold or the half cut on the gate fold. 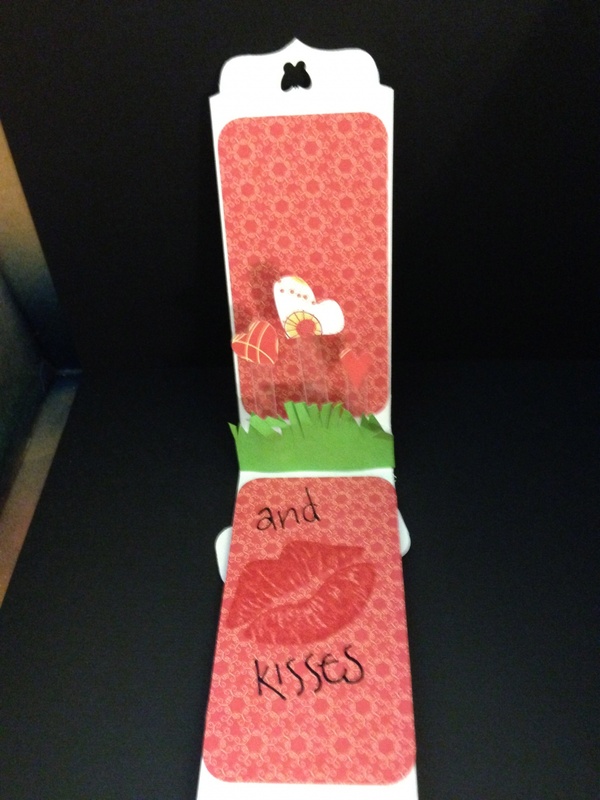 I used tape to hold the die and the cards in place ( I used two pieces cute 2″ x 6″) but you could do it also with the long strip of paper but you need to cut both ends at the same time so that they match up perfectly. I used a piece of blue paint tape to hold it in place but you could also use a post it note. 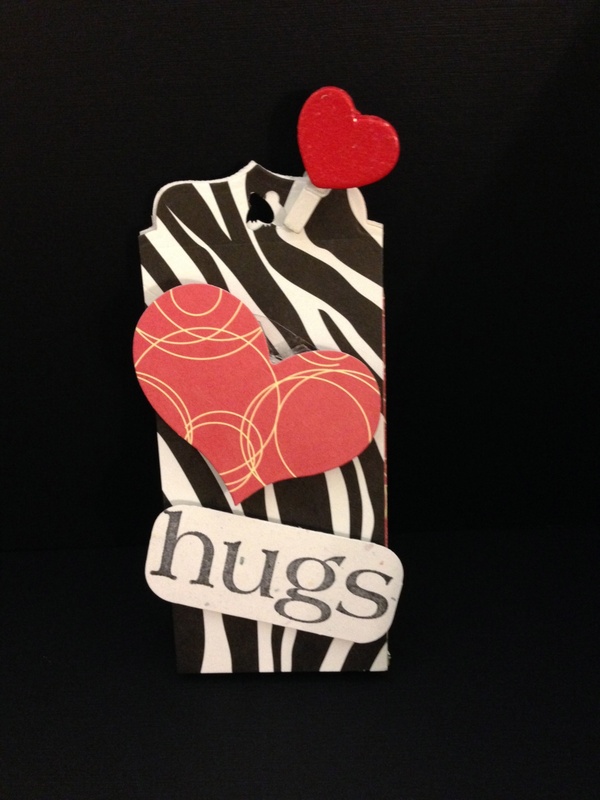 Below is DAWN’S VIDEO and its very similar but she is using her’s to make a candy bar holder…there is also a video for the one that is the size of mine but its at STAMPING SCHOOL and you won’t be able to see it unless you have a paid membership.SS cut her’s 10 ” long by 2 ” wide…. 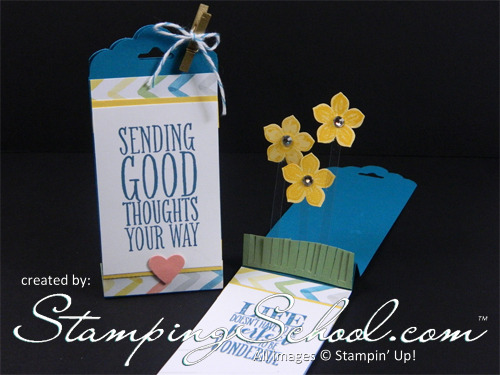 ( actually she says just shy of 2″ so it fits in the STAMPIN UP TAG TOPPER PUNCH..if you don’t have it or aren’t using it then 2″ is just fine. 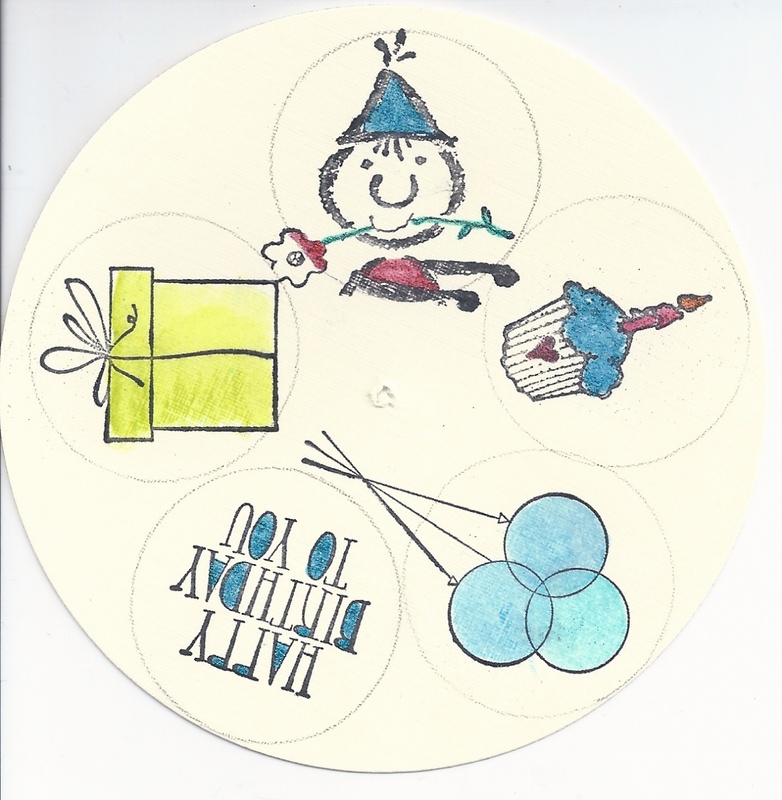 These are the measurements from the card that I saw on STAMPING SCHOOL..I like the idea of a card more than the candy holder but if you work or want to make them for your kids to take to school it would be very cute… the CANDY TOPPER does NOT have a pleat since it doesn’t need to fold flat. 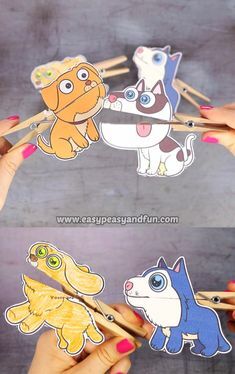 FOLD IT SO THAT YOU HAVE MOUNTAIN PEAK IN THE CENTER..
ONCE ITS FOLDED THEN YOU CAN CUT your fancy top or you could just round the corners at the top and also had a small hole punch in the center.. It can be either a plain round hold or it can be a tiny fancy punch I used a small butterfly. I also had some fun little clothespins with hearts on them so I used that to hold it closed and no twine tied on at all. 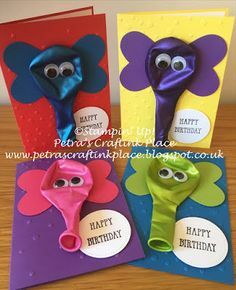 But if you don’t have clothes pins then you can by all means use ribbon or twine to tie it shut or a fancy paperclip with a piece of ribbon attached… any way will do and its the pleat at the bottom that allows it to stand upright . HINT…. IF your attachment embellishment creates a BUMP in your envelope you will need to use a more expensive stamp …and since the postage has changed I am not sure what that amount is…sorry.. I will find that out and add it to the post. 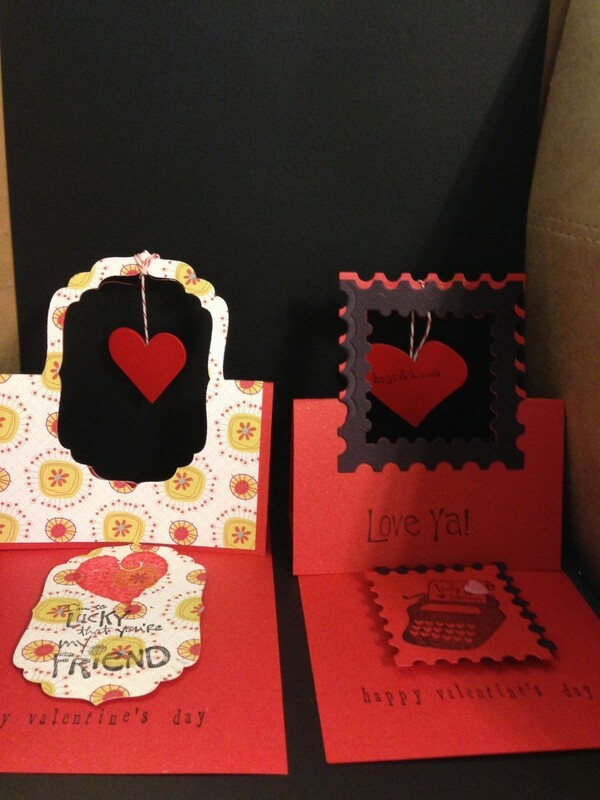 TIP….If you use two precut tags or you cut two strips of paper and so then you need the PLEAT at the bottom so that the card is able to fold flat for mailing. 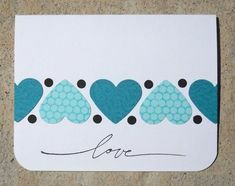 CUT A PIECE OF PAPER 2″ LONG and as wide as the tags . 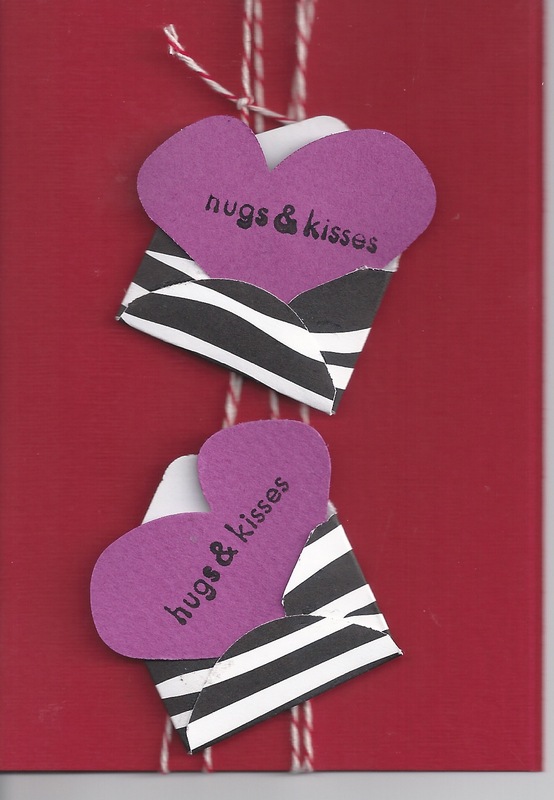 Just like DAWN’S VIDEO..score it at one inch then ½ inch on ease side… then using the red super double stick tape apply it to each tag and then insert the pleat sticking it to each tag. STAMPING SCHOOL used flower stamps and punches to create the flowers in the center of the tag and her big TIP was using small strips of acetate for the stems.. I SAVE PIECES of acetate when they come my way so I did have some to use as stamps but then you’ll notice I was going for a valentine so instead of flowers I used HEARTS that I punched out . 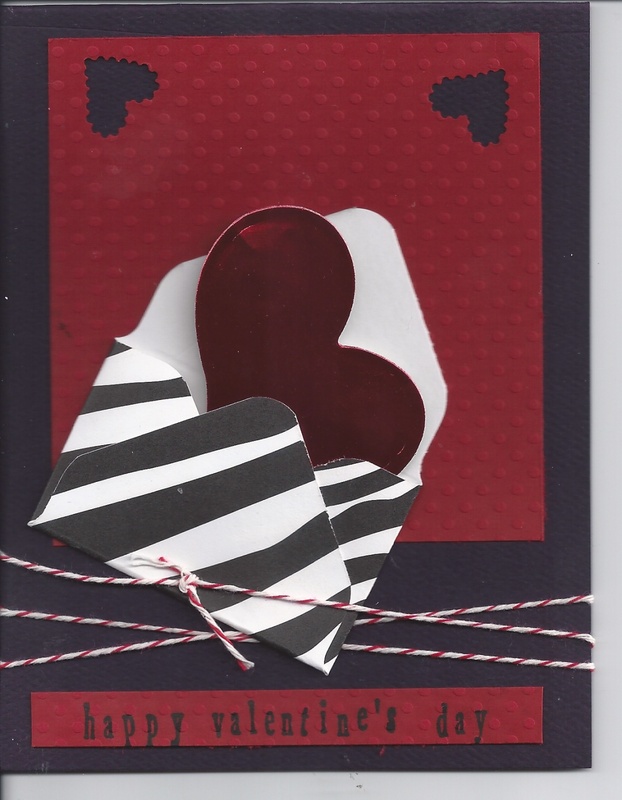 I also used a strip of card stock and then glued a small heart on upside down to look like a candle….Just let your imagination run… one last TIP…when I use the multi blade scissors..I cut at a diagonal and the grass is then different lengths and more realistic. Ok time for some photos…worth a 1000 words. This is the die used to cut the top but I did rotate it so that I was cutting the point at the top of each side of the tag…and I had these strips of zebra black /white so I used two of them and cut them together so they would match ..then I added the pleat at the bottom it was easier to cut the top that way. 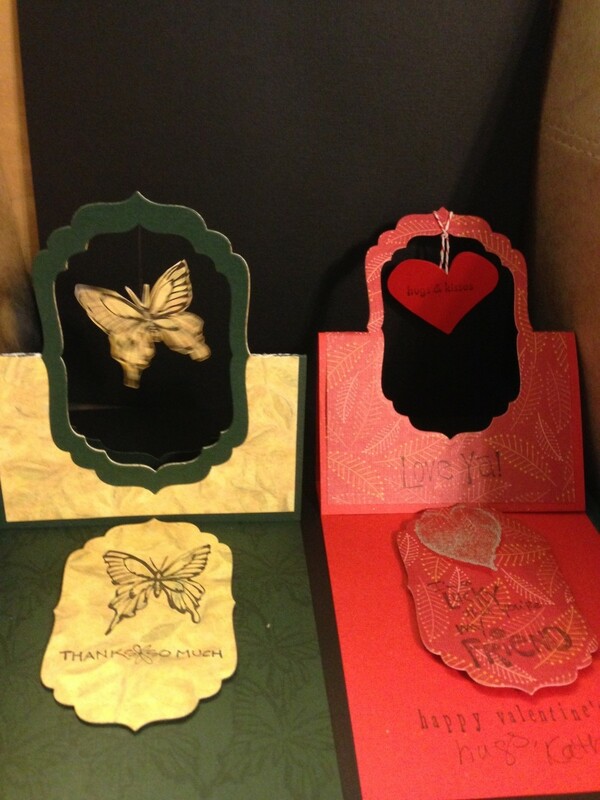 If you do use a punch to cut the tops you will just have to be really careful and try to eyeball it in the same places so that it matches…MOST PUNCHES WON’T PUNCH THRU 2 sheets of card stock however the Big Shot or cuttlebug will unless your card stock is very heavy. I think I got the precut tags in multi colors from Jo Ann’s but you can probably find them at Michael’s or Hobby Lobby as well.